Detour Gallery invites you to enjoy the visual ride of what Jones describes as, Urban Industrial Futuristic Cave Paintings. Born and raised in Michigan, Ron Haywood Jones attended Parson's School of Design graduating with a BFA. His career in textile design is evident in the decorative elements of his artwork, seen with his use of bright color, repetition, and texture. 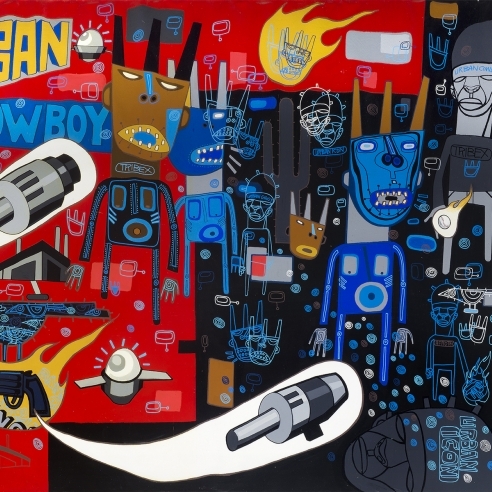 Ron Haywood Jones has been featured in #THEUNKNOWNS, a project created by Kasseem Dean (also known as the rap producer Swizz Beatz) featured at the Brooklyn Museum, Bronx Museum, and Sotheby's. Alongside the works' decorative aspects is an urban influence that maintains commentary on past and current social movements and issues.